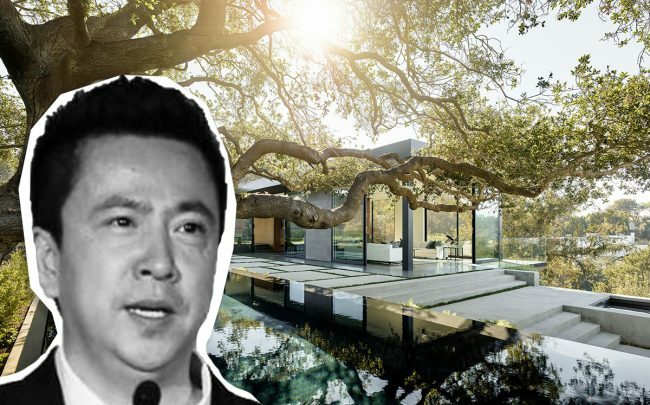 James Wang, founder of one of China’s largest entertainment firms, has listed his Beverly Hills mansion. The so-called ‘Upside Down’ house is on the market for $32 million, the Wall Street Journal reported. The property designed by Los Angeles architect Noah Walker features entertainment space on the top floor, with two-thirds of the house below-grade, built into a hillside. The home includes 8,000 square feet of space with four bedrooms, the Journal reported. The 3.5-acre property on Oak Pass Road also includes a 2,400 square-foot guesthouse with two bedrooms, and a 75-foot infinity pool. It’s built around more than 100 protected oak trees that frame the house. It belongs to a holding company that’s run by Wang, who is selling because he is building a new home in the Bel Air area, according to the report. Wang and his brother, billionaire Dennis Wang, founded Huayi Brothers Media. The neighborhood is familiar with big-ticket listings. Two years ago, the property at 9694 Oak Pass Road was listed for $22 million, and shortly after, Jessica Alba purchased a 1.85-acre property on Oak Pass Road for $10 million.